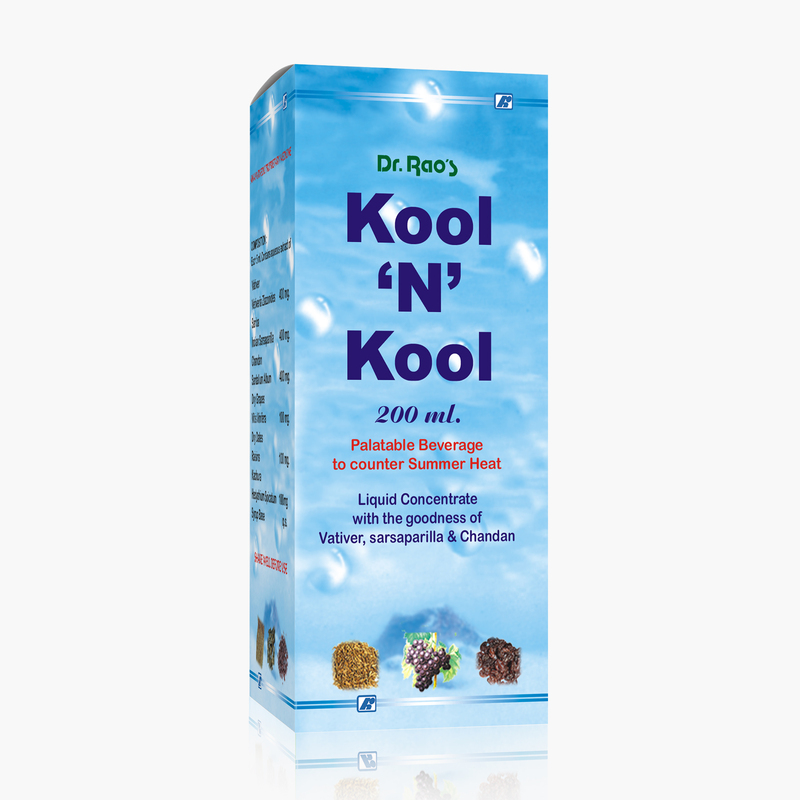 Dr.Rao’s Kool N Kool is An Ayurvedic beverage made by selecting judiciously a group of natural herbs like Sarsaparilla (Sugandhipala), Sandal wood (chandanam), Kus-Kus (vattiveru), Resins (Dried Draksha), Dates (Karjur Dried Fruit) and Curcuma Zerambet (Karchuram). A most palatable and pleasant summer drink to counter summer heat, preventive for sunstroke, exhaustion & excessive sweating.Maintains ph value of the blood and thus checks giddiness and reduces body temperature etc. All our products are naturally flavored and free from any sort of chemical flavors and coloring agents. Adults, Children and infants can enjoy the drink in summer as it keeps body cool. Due to exposure to summer heat people develop sudden frustration-exhaustion- tiresomeness with severe thirst, suffer from painful cramps occasionally leading to Sun-stroke. One cannot escape the environmental heat & humidity. To fight summer heat and restlessness, Ayurveda a centuries old natural medicine suggests use of above mentioned natural herbs. Provides relief from heat, thirst and possible sunstroke. Maintains PH value of the blood and thus checks giddiness. Naturally flavored and free from chemical flavors and coloring agents. Vetiveriazizanioides (Vativer), Hemidesmusindicus, Santalum album, Vitisvinifera, Dry Dates (Raisins), Curcuma zedoaria, Syrup. For a better relief from summer heat, exhaustion, excessive sweating thirst, tiredness, cramps due to summer heat and sun stroke, high temperature etc. MIX: Mix one part of Kool ‘N’ Kool with three to four parts of cold water, soda or milk. No need to add sugar. For better palatability mix with cold milk. It is recommended to take three to four times daily especially during summer. 25ml. pouch, 200 ml. & 500 ml. in pet bottle.